invoko officially launches next week - the new collaborative side venture jointly marketing the talents of: sound designer Dave Schroeder--PilotVibe, graphic designer Nathan Strandberg--EightHourDay, and myself--Jonathan Chapman Photography. 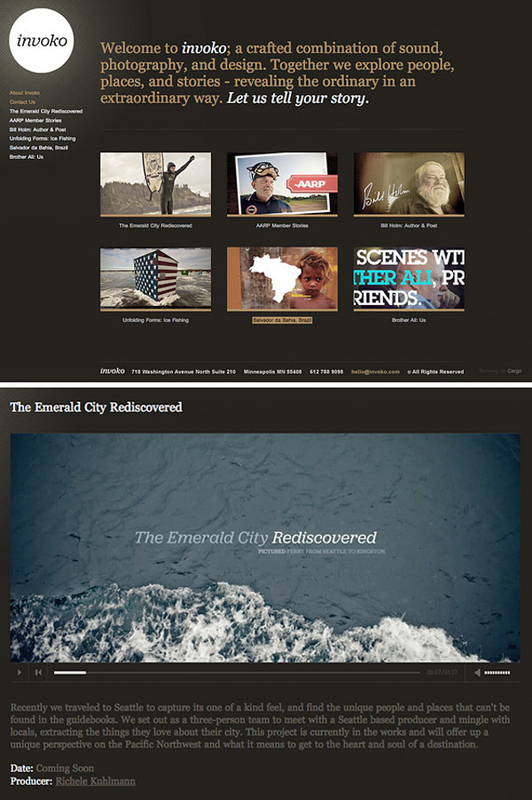 When at the site be sure to check out the trailer for "The Emerald City Rediscovered," an unconventional take on Seattle and some people and places you typically won't hear of. The full version of this piece will debut in days ahead. In the coming weeks and months we'll be hitting the pavement, talking to a varied list of local and national clients, spreading the word about our new collaborative effort of mulit-media / interactive storytelling. A great team, telling stories in fresh and innovative ways! As promised in last November's post, the media portion of the running test is up and ready for review here on the blog or in the JC|P Motion section of the website. Awaking at 4:30 a.m. on a recent morning, my assistant and I set off for Superior, Wisconsin on an assignment for Chicago Magazine. Our subjects were a husband & wife team, originally from Chicago, who made an unconventional late career change. Taking up a new life together, they have focused their efforts on the monumental job of salvaging 6 million board feet of virgin lumber from three free standing, 133 year old grain elevators along the shoreline of Lake Superior. The images above were shot just minutes before we arrived, traversing Lake Superior as we left Minnesota for Wisconsin. While not an idyllic mid-winter destination, from a travel agent's perspective, I always welcome the chance to head north, shedding a bit of the city for however long I am able. For me it's the first glimpse of Lake Superior that signifies the arrival of "being up north." 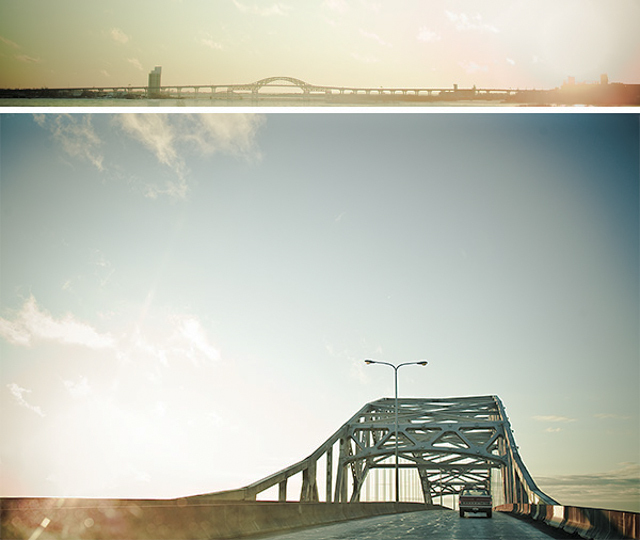 Travel north this time of year and at this time of day offered a new perspective to a fondly familiar place. Talent at the ready, four wheels and a skin of metal punctuated with a blue and white emblem translated to quite a visual afternoon + evening in late November. 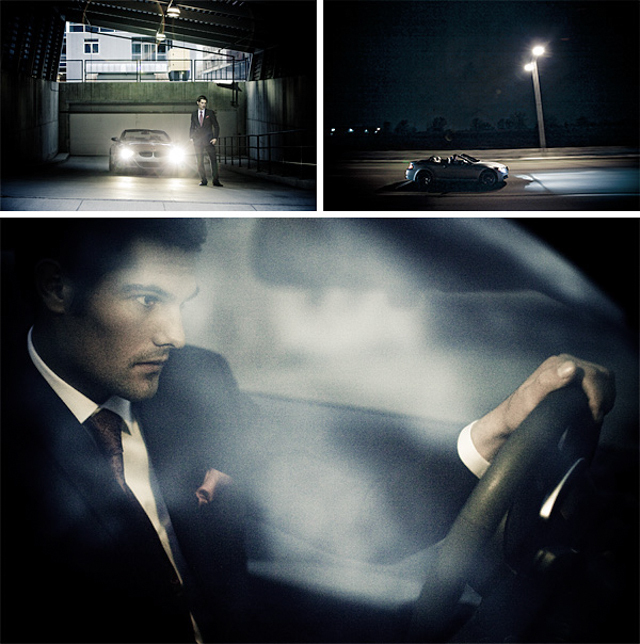 The shoot was loosely storyboarded as: a model, a car, and some pre-scouted locations within Minneapolis' Warehouse district. The logistics and weather came together perfectly to shoot this project which had been brewing for some time. The vehicle was acquired via Euro Cars in Eden Prairie and Matt our talent from Caryn Model and Talent Agency. As with the Runner shoot we brought in Alex Horner once again to capture video assets alongside the stills I was gathering. The video portion of this shoot should be out soon - I look forward to announcing in a future blog post. For now please check out the gallery of additional stills at the archive section of my site. I am also planning an upcoming e-mail blast based on one of the shots. Keep an eye on your inbox as this will hit very soon.